Sir William "Billy" Connolly CBE (born 24 November 1942) is a Scottish comedian, actor, voice artist and musician from Glasgow. 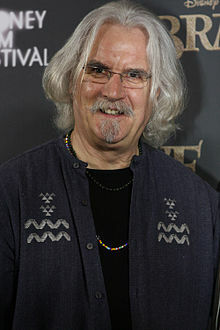 Sometimes, he is known as The Big Yin (The Big One in Scottish). Connolly was born at home in Anderston, Glasgow. He grew up in a tenement in the same inner-city area. Connolly has five children. He is married to Pamela Stephenson, the mother of his three youngest children. In 2013, he was diagnosed with Parkinson's disease and had surgery for prostate cancer. In January 2019, Connolly said he was "nearing the end of his life" as his Parkinson's advanced. Connolly has acted in many movies including: Indecent Proposal (1993), Mrs. Brown (1997), The Boondock Saints (1999), The Debt Collector (1999), The Man Who Sued God (2001), The Last Samurai (2003) and Lemony Snicket's A Series of Unfortunate Events (2004). He provided voices for the movies Garfield: A Tail of Two Kitties (2006), Open Season (2006 and 2008), and Brave (2012). Connolly has been repeatedly voted Britain's best comedian by television viewers. He is also a folk musician and television presenter. Connolly was nominated for a BAFTA award for his role in the movie Mrs. Brown. He was given a CBE in 2003. ↑ "Billy Connolly confronts his losing battle with Parkinson's disease". Newshub. Retrieved 2019-01-03. This page was last changed on 3 January 2019, at 21:27.